On Saturday, 23 June 2018, the Ukrainian Catholic Cathedral in Westminster will solemnly mark the fiftieth anniversary of its opening. For over forty of those years, it was known as “The Holy Family in Exile.” We might say that the existence of this cathedral can trace its origins in two historical events: the forced emigration of Ukrainians from their homeland, during and after the Second World War, and a promise made to them by the Pope. The Greek-Catholic Church had been outlawed by the Soviet Communists in 1945, but Pope Pius XII defended it and made a promise to preserve the Church abroad and to reconstitute its hierarchy. His Apostolic Constitution, Exsul Familia Nazarethana (The Nazarene [Holy] Family in exile), of 1 January 1952, was part of that promise. Known as the magna carta on migration, it mandated that diocesan bishops had the duty to offer special pastoral care for migrants and displaced persons. Placing the Faith above all, the Pontiff supported he migrants desire to maintain their ethnic traditions, language, and gave particular attention to preserving the Rites of the Eastern Churches. Ukrainian Greek-Catholic immigrants began to form a community in London in 1946. Bishop Ivan Buchko, whom the Pope had appointed as their overseer (apostolic visitor) throughout Western Europe, visited London in January 1947, and sent a permanent pastor two months later. This priest chosen for the mission was Father Josaphat Jean of the Basilian Order, a French-Canadian who had adopted the Byzantine Rite to minister to Ukrainian immigrants in Canada. With the assistance of community leaders, organizations, and the Archbishop of Westminster, Father Jean was able to acquire a small church in Saffron Hill, Holborn, in July 1948. The first Ukrainian Catholic Church in Britain, dedicated to Saint Theodore of Canterbury, was solemnly blessed by Bishop Buchko, on 5 December 1948. Buchko and Jean understood that this first edifice was temporary, intended to provide a stable place for worship and to gain a foothold in London. From the beginning, however, they looked ahead to a larger church, once the congregation became more stable and better equipped financially. Jean was recalled to Canada in the Summer of 1949. Bishop Buchko replaced him, as his British Vicar General, with Redemptorist Father Volodymyr Malanchuk. In 1951, Malanchuk himself was recalled to Canada and was succeeded by Monsignor Oleksander Malynovsky. In the early 1950s, the little church in Saffron Hill was rededicated to the Protection of the Mother of God. In only a few years, the Ukrainian Greek-Catholic Church made great progress in Great Britain. It acquired churches in several major centres, such as Manchester and Nottingham. Through the work of his minister for Eastern Catholic Affairs, Cardinal Eugène Tisserant, Pius XII began to establish missionary dioceses to replace Bishop Buchko’s provisional mission. Apostolic exarchates were established: in England in 1957, in Germany in 1959, and in France in 1960. Nevertheless, when asked for their opinion in 1954, the Catholic Bishops of England and Wales were not enthusiastic about a special jurisdiction for Ukrainians. In order to soften the blow, Cardinal Tisserant asked the Archbishop of Westminster, Cardinal Griffin, if he would take on this responsibility himself. Griffin agreed but died soon afterwards. 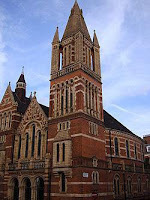 His successor, William Godfrey also accepted and was solemnly enthroned on 9 November 1957, at the little Saffron Hill church. The Papal Bull establishing the exarchate, dated 10 June 1957, stated that it needed a cathedral church in London (probably at Bishop Buchko's suggestion). The project for a cathedral fell to a new Vicar General, Canadian Redemptorist Father Paul Maluga. In March 1958, Godfrey made the first contribution to the cathedral fund of 2000 Guineas (slight more than 2000 pounds). Maluga commissioned sketches for a new church in the Byzantine style, and the fundraising campaign was inaugurated on 2 December 1959. Despite his Canadian pragmatism, energy, and enthusiasm, Paul Maluga’s project encountered opposition from segments of the local Ukrainian community and even some clergy. In the end, he raised just over 17,000 pounds, which was barely enough to buy London property. The new exarch abandoned Maluga’s earlier project, deemed unworkable, and chose to purchase an existing church. In May 1963, the exarchate purchased the former Catholic Apostolic Church in Duncan Street, Islington. Hornyak established an advisory committee with members from all over England, together with an executive committee, to plan the necessary extensive renovations and a fundraising campaign. The executive committee was made up of Fathers Vivcharuk, Havryliuk, Orach, Muzychka, Mykhalsky, Professor Robert Lisovsky, Architect Vasyl Boretsky, Engineer Vasyl Oleskiv, and Engineer Malytsky. Boretsky was asked to prepare plans for the alterations to the exterior and interior of the building. However, by August 1964, estimated renovations of the exterior alone had risen from 30,000 to 45,000. In 1965 the bishop decided to demolish the Islington church and build a new structure. Bt the committee ran into difficulties with the Islington authorities over a church hall and parking space. While waiting for planning permission, Hornyak asked committee members to keep watch for another property. In August 1965, Canon Rivers, the financial secretary of Westminster Archdicoese, drew Hornyak’s attention to a property in Duke Street, which had recently come onto the market. Formerly the Congregationalist King’s Weigh House Chapel, it was being used as a place of worship for the American Navy, and the hall beneath was gallery for hire. On 27 January 1966, the cathedral committee met at the “Weighouse Gallery” to inspect the building. The asking price was 150,000 pounds, an amount far beyond the Ukrainian Exarchate’s resources. Nevertheless, Bishop Augustine petitioned Rome for permission to purchase it. The Oriental Congregation authorized the purchase in December 1966, and promised to help cover the interest on the loan, if donations from the faithful did not suffice. The Ukrainian Exarchate had deposited its cathedral fund with the Archdiocese of Westminster at a rate of 5% interest, and Canon Rivers had promised than the Archdiocese would grant them a loan, at the same rate. But to Bishop Hornyak’s surprise, when he returned from a trip to United States in November 1966, he discovered that Rivers had left the finance office, and Cardinal Heenan said he was unable to offer the loan directly. Nevertheless, Canons Rivers was still able to negotiate a loan from the National Bank Ltd., as Westminster Diocesan debt, on behalf of the Exarchate. And the following year, Heenan made a donation of 2,500 pounds, from personal funds. “I am asking for a part of the Universal Church of Christ, for an Exsul familia, which wants to survive here and to sustain the 'Church of Silence' in our homeland.” Archbishop Cardinale seconded the cause before the Congregation for the Eastern Church, which granted a subsidy of 100,000 US dollars, allocated by various Catholic charities. After difficult negotiations, bids and counter bids from another buyer, the cathedral committee petitioned the city for a preservation order, declaring the church to be object of art. This caused the other party, which had intended to demolish the church, to make their offer conditional, and the Charity Commission ruled in favour of the smaller, Ukrainian offer of 155,000 pounds. But this amount still necessitated a third fundraising campaign. In April 1967, the faithful were informed of the impending purchase. And on 18 July, in the presence of the committee executive, Augustine Horynak signed the contract to purchase the King’s Weigh House and its adjacent residences. These became the property of the Ukrainian Catholic Church on 26 October 1967. Upon the Apostolic Delegate’s recommendation, in January 1968, Pope Paul VI extended the Exarchate’s jurisdiction to all of Great Britain, including Scotland (in 1957 Godfrey, as the head of the English and Welsh episcopate, could not have jurisdiction in Scotland). Unfortunately, as with first cathedral campaign of 1959, there were those in the British Ukrainian community that sought to limit the authority and prestige of the Ukrainian Catholic Church. At the very same time, rival fundraising campaigns were initiated and, in order to frighten donors, rumours were spread that the new cathedral would not belong to the Ukrainians but to the Vatican. As a result of these intrigues, the community was mediocre in its support and the debt lingered into the mid 1970s. In February 1968, Bishop Augustine discussed the alterations to the interior of the church with Architect Boretsky and, on 21–22 February, the priests in clergy conference gave their opinions regarding an opening date. On 29 March Kyr Augustine informed them that the inauguration would be divided in two. In order that the faithful could begin to use the church immediately, only the most basic alterations would be made to the cathedral, so that a simple blessing and opening could take place by June. 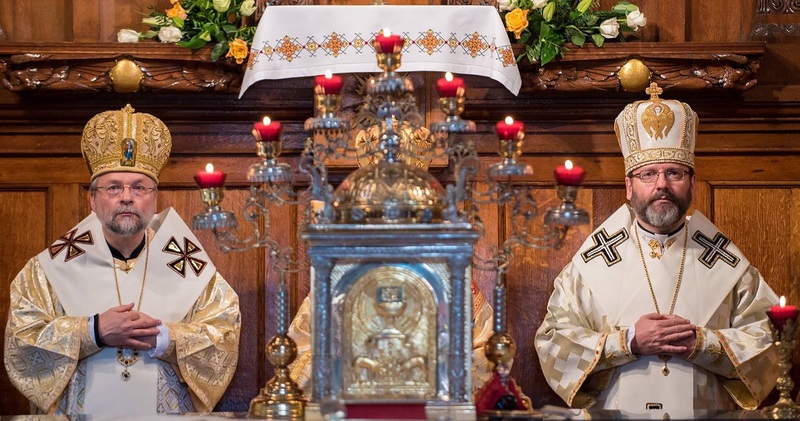 The full consecration rite would be postponed for a year or two, until after the installation of the iconostasis and the paying off of the cathedral debt. The simple opening was announced to the faithful in April, and Archbishop Cardinale, who had been much responsible for the acquisition of the building, agreed to attend. The Cathedral committee helped plan the opening ceremonies, which were extended over Saturday and Sunday, so that all the clergy could participate. The London parish had already had two patrons: Saint Theodore of Canterbury and the Protection of the Mother of God. For the new church, Kyr Augustine chose a new name: “The Holy Family in Exile,” based on Pius XII’s charter for displaced persons. On Saturday, 29 June 1968, at 3:00 PM, Bishop Hornyak greeted Archbishop Cardinale at the cathedral entrance. In the name of the Holy Trinity, the two prelates opened the doors and sprinkled the interior of the cathedral with holy water. The bishop-exarch and twelve priests concelebrated a moleben of thanksgiving to the Mother of God. Apostolic Delegate Cardinale spoke in English and Bishop Hornyak preached in Ukrainian. Undeterred by a partial rail strike, over 1000 faithful travelled to London by coach and automobile. On the following day, Sunday, 30 June, Hornyak celebrated the first hierarchical Divine Liturgy together with Fathers Stefan Vivcharuk, Oleksander Babiy, Yarema Havryliuk, Stefan Orach, and Danylo Humnicki as deacon. The responses were sung by Boyan Choir, under the direction of Mykola Solomka. A second Divine Liturgy was celebrated by the priests in the afternoon, sung by Verkhovyna Choir of Coventry, under the direction of Mariyan Kostiuk. The opening of the cathedral occurred during the tenth anniversary of the Exarchate and the twentieth of the Ukrainian Greek-Catholic Church in Great Britain. The event marked a high point in the history of the Ukrainian community. In the fifty years that have elapsed since that joyous day, the cathedral has witnessed moments of of great joy but others of bitter sorrow. An historical turning point occurred with the visit of Cardinal Yosyf Slipyi, Head of the Ukrainian Catholic Church worldwide, on 8 May 1970. Slipyi’s unwavering crusade for a Ukrainian patriarchate was strongly supported by the British Ukrainians, clergy and faithful alike. But a conflict between him and Bishop Hornyak led to a bitter division. The majority of the parishioners abandoned the cathedral, and visitors, On a Sunday morning in the late 1970s, visitors from abroad found a cold, sad place, attended by a remnant of 30 faithful. Due to lack of income, the planned second phase, including the installation of an icon screen and solemn consecration, had to be postponed indefinitely. A decade later, the cathedral slowly came back to life. One of Bishop Augustine's final acts was to begin installing the iconostasis with icons commissioned from Father Yuvenaliy Mokrytsky. In 1987, Hornyak was replaced by an interim administtor, Bishop Michael Hrynchyshyn, and in 1989 Bishop Michael Kuchmiak was enthroned as exarch. Beginning in the mid 1990s, an influx of new parishioners from independent Ukraine transformed the cathedral, restoring much of its former glory. As a result of this change, the young and energetic Basilian, Paul Chomnycky, succeeded Kuchmiak in 2002. Less than four years later, Chomnycky was transferred to the Stamford Eparchy in USA.